London Days: CASology Guest Designer! I have added Wink of Stella to my splatter and sentiment but it is hard to see in this photo. Purple glitter card....was this made for me!!! You purple splatter is so cool Sandie, so glad to have you join us this week as Gue Designer! Congrats! Congratulations on the GD spot Sandie! Thanks for the beautiful inspiration you provided! Splatter, the perfect theme for you! Congrats on your win and GDT spot! I had to google Wink of Stella to se what that is, seems like great pens for adding shimmer. Currently on business trip, it's freezing cold in the hotel room and can't wait to get home to hubby and craft room! Very pretty card! Love the purple glitter and the splatters! Thanks for joining us this week at Just Us Girls! Congrats on your Guest DT spot at CASology, Sandie! I love your sparkly splatters, and your purple glitter border is the perfect touch! Perfect splatter Sandie! So glad to have you as our guest designer at CASology this week! I love a bit of splatter on a card and yours is perfect. Love the glitter. Great cas card. Thanks for sharing it with us at Just us Girls. Super love your card, Sandie!! I am loving the purple! Congrats on your well-deserved GD spot at CASology! They couldn't have picked a more amazing GD! Hugs! Sandie, what a glorious, glittery card! 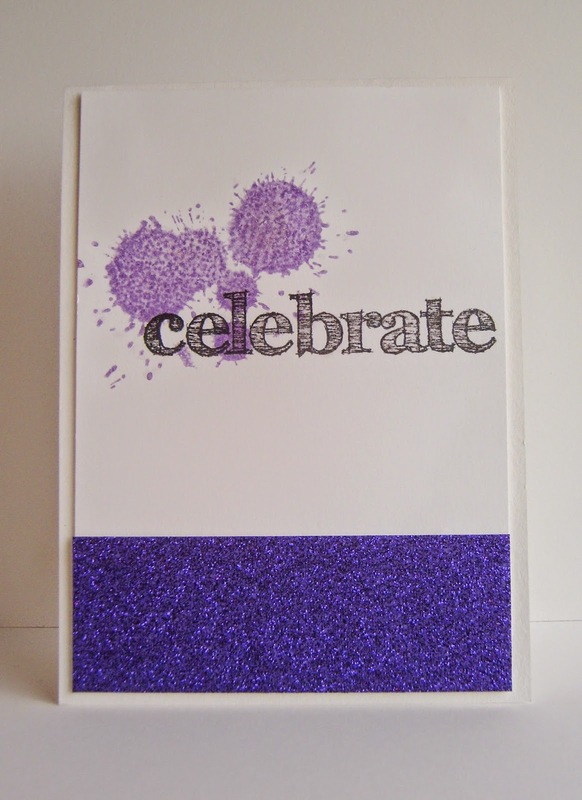 Love the sparkly purple splatters! So glad to have you guest designing with us this week at CASology! Just AMAZING and sparkly and all that fun stuff that makes me smile!! 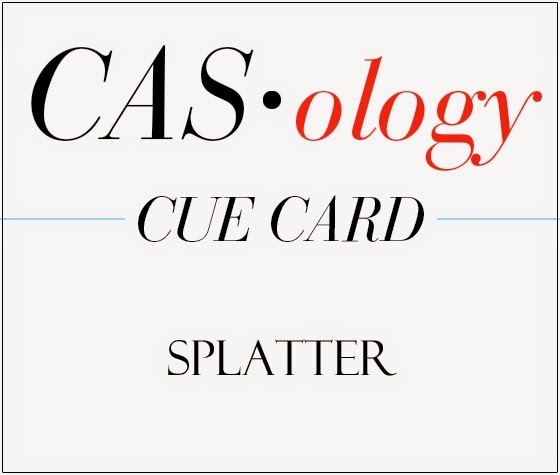 So happy you are guesting with CASology- Bravo- Well deserved!!!! Yay!!!! Congratulations on your GD, very much deserved with your 'leaf' card. Love your purple 'splatter' and that hit of glitter is a perfect finish. Brilliant! Beautiful card Sandie! love the purple and glitter. Congrats on your Guest Designer gig, Sandie! This is full of sparkly goodness and I LOVE the purple! Great design! Very cute! I love the splatter effect! Love the splatter and the Clean lines! Thanks for playing along with our challenge this week at Just Us Girls! What a fabulous card for splatter. I love the purple and the glitter and shimmer. Thanks so much for joining with us this week as Guest Designer. It's wonderful to have you here. This is so gorgeous...I love all that purple! I LOVE that fabulous sparkly purple strip and the awesome font! So glad to have you as our GD this week! Cheering and applauding your GD role at CASology - and what a fabulous card you've created to spark inspiration! Purple prettiness, indeed. Another card of yours to adore! Love the way the purple works on this card! Fantastic! Hah! It's like spotting an old friend in the street and they've just had a makeover. Yes I still love the stamping I saw you do, and the addition of the glitter paper is the perfect way of ramping up the celebratory theme. Love your monochromatic rendition of this CAS card, Sandie! That touch of glitter is fabulous! So glad that you join the fun over Virginia’s View Clean and Simple Challenge! My belated congrats on the guest design!